My sister and I recently went to visit a little town on the Sunshine Coast, called Montville. Cute as a button it was. A real touristy place, with plenty of quint little shops and boutiques and surrounded by forest, making you feel that you have landed in a plush bubble of niceness where time has magically stopped and nobody is in a rush anywhere. Families and little children walking around with ice-creams and chocolates and candy from a (real) candy shop. Cosy little coffee shops, where you could spend the whole day sipping on lattes. We stayed at a charming little motel where we were greeted by the loveliest host ever, Angus, who straight away made us feel at home. We asked Angus where he thought the best place was to eat, so he took us through all the options talking a little about the best dishes at each and about some of the quirky owners. One of his top recommendations was the local pub, and hesitations aside, we gave it a try. And my goodness, were we thankful for Angus’ advice. Hands down the best meal I have eaten in a very long time. During our stay I flicked through a coffee table book on Montville and a few of the surrounding towns and came across a culinary school they have in the area. They pride themselves on the fact that they only make use of local and fresh ingredients in their cooking, everything is made from scratch and strangely no microwaves. They believe in the principle that if everything is made fresh and from scratch, there should be no need for microwaves. And it made me think of my own microwave at home, how many times I open it and use it without really even thinking about it. 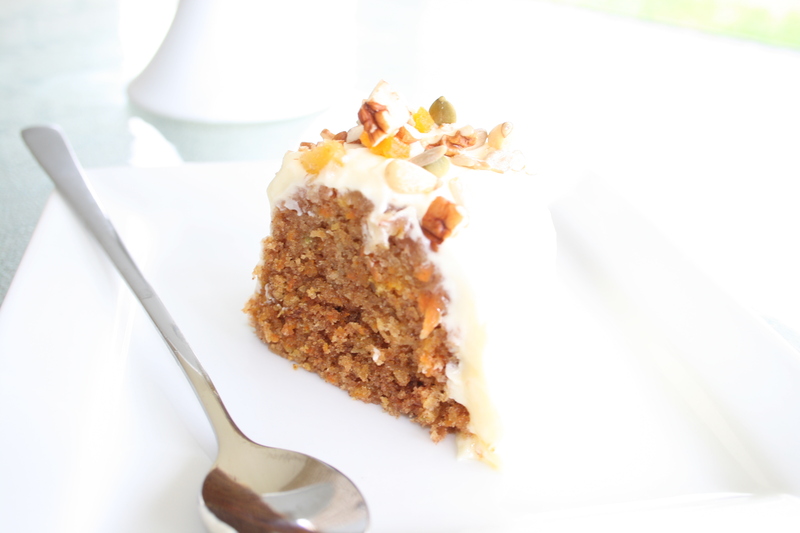 I cannot imagine not having it, if for no other reason than being able to make my carrot cake. We have a family recipe for a carrot cake that you bake in the microwave, and hand on hart, it is the easiest cake you will ever bake. All the ingredients go into one bowl and only needs a quick stir before pouring it into a ring mould and placing it in the microwave. 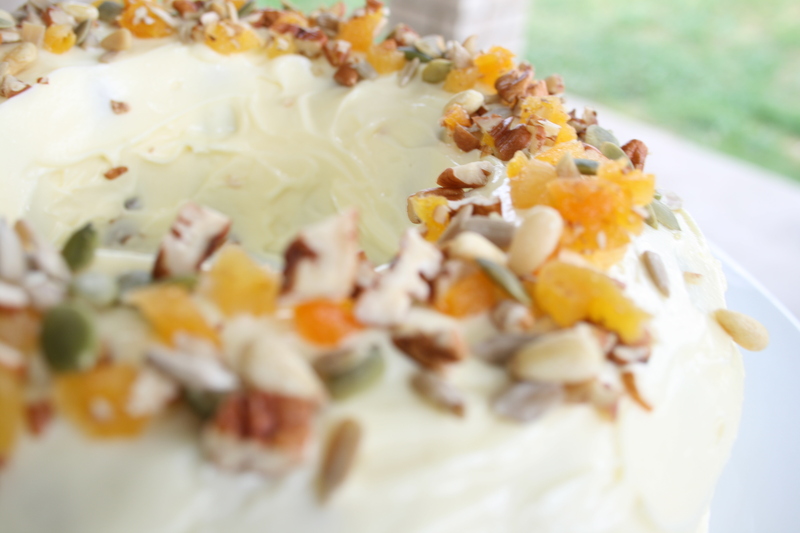 It produces the moistest, most flavourful carrot cake you will ever eat, and of course covered in the most decadent cream cheese frosting imaginable. Combine all the ingredients and mix together with a wooden spoon until everything is mixed through, no more than 2 minutes. Spoon the mixture into the ring mould. Cover with cling film and pierce a few holes to let the steam out during baking. Bake in the microwave on medium for 14 minutes (although I would recommend checking after about 12 minutes). Cream cheese frosting: Cream the butter and icing sugar until light and fluffy (I only add 1/4 cup of icing sugar at a time mixing it until fully incorporated). Mix in the vanilla essence. Then add the cream cheese and only mix until the frosting is nice and smooth, about one minute. 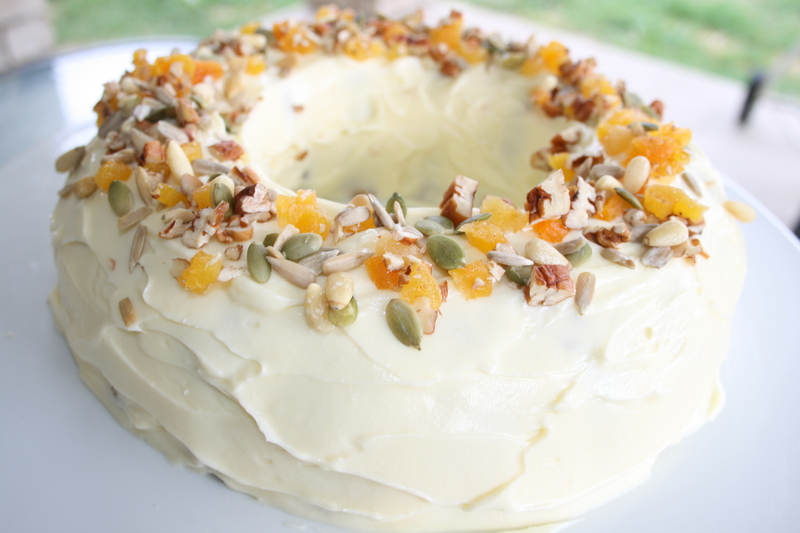 Once the cake is completely cool cover with cream cheese frosting and decorate with nuts, seeds and chopped apricot. It looks fabulous! I must get a ring tin/mould one of these days! Microwave cake eh, nifty! Thank you 🙂 …super nifty!! It’s Keriana here I used to be in your sisters year7 class and she told me that you were haveing a baby!